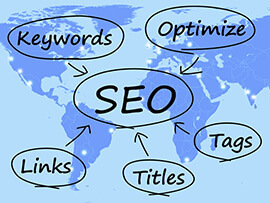 Initial keyword research to identify an initial Working Keyword List to target. Full on-page SEO to establish thematic/keyword relevancy for all target keywords. Website internal link architecture implementation to sculpt Domain Authority (DA) and Page Authority (PA). Social media property audit and cleanup. Optimization of Google Places page. Audit and initial cleanup of company citations (directory listings). Initial round of citation creation. A business citation is simply a mention of your business’ Name, Address or Phone Number. Initial setup / integration of additional social media platforms for optimal SEO benefit. Ongoing continuous link building to increase DA and PA, including: Private Site links, Authority Site Stacking and Multitier link building. Ongoing continuous social signal (Tweets, Facebook Shares, Bookmarks, etc.) generation to increase Google Panda Quality Score while simultaneously increasing DA and PA. Ongoing continuous citation creation to increase visibility within local results and maps results. Creation and posting of four (4) curated blog posts per month to the company blog. Monthly keyword Rank Reports and Google Analytics.